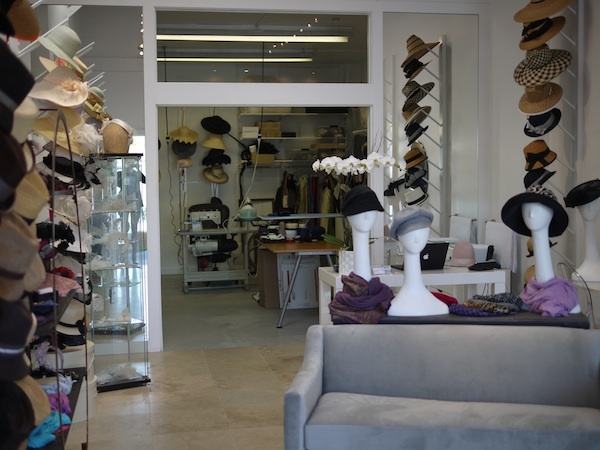 When I was in Southern California recently, I drove down from Los Angeles to the San Diego area to the brand new retail location of Jill Courtemanche Millinery, to deliver my first shipment of hats to the shop. As you can see in the photo below, her workshop is in a room behind the showroom area. I would love to have a similar set-up when I open my own shop someday. Here's a photo of Jill. Jill had officially opened the shop just the week before my visit, but she already had everything so organized and beautifully arranged. She told me that they had had to start building out the space from an empty shell, and she had obviously put a lot of thought and effort into making it fantastic. Her showroom area and studio are spacious and full of light, yet filled with so many great things to look at. I was impressed with her collection of vintage felts, and also with the range of different designers she carries, and I'm happy that my hats will be there in the mix. We had exchanged emails before, but hadn't met in person, so we had a nice, long talk over lunch at a great cafe near the shop. Then Jill gave me a tour of the showroom, introducing me to the work of the various designers she has there. I had brought several boxes of hats with me- Jill chose three to keep in the store and placed an order for nine more styles. She'll have a selection of House of Nines Design hats in stock, including top hats and other minis, ladies casual hats, and mens hats too. And she's got some special styles and color combinations that you won't find online until next year, if ever, like this 'Viola' in silver gray long-nap felt with black trim. If you're in the area, stop in to see what she has in stock and to have your head measured for a full-size hat- if you find a full-size hat you like there but need a different size, Jill can send me the style and size you need and I'll make one and send it on down. For more info about Jill Courtemanche and her business, see below for a press release about her store opening. (San Diego, Calif. - Sept. 6, 2012) - From fascinators to fedoras, Jill Courtemanche's hats have topped Yoko Ono, Donatella Versace, Princess Mary of Denmark, and football legend Jose Foure and now - after years of working in New York and Europe - she is opening her first retail store in the Cedros Design District of Solana Beach. Jill Courtemanche Millinery (JCM) opens November 8, 2012 and features handmade hats as well as bridal headpieces and veils and a modern collection of accessories for men. "I am so excited to be opening up my first store here in San Diego and having the opportunity to share my vision of fashion and design with a community that already had such rich ties to millinery in the Del Mar Race Track and San Diego Polo Club," Courtemanche said. Jill Courtemanche graduated from New York City's prestigious Fashion Institute of Technology in the mid-90's and after a decade of working alongside master artisans in New York and Europe, opened her namesake atelier in 2006. Courtemanche brings a young, feminine and contemporary approach to her hats while incorporating traditional techniques and craftsmanship. All JCM hats are handmade using vintage materials, trims and embellishments combined with modern fabrics. The store is also Coutemanche's studio, so on any given day you will see her piecing together her one-of-a -kind creations. "I have always wanted to open a hat shop with a voyeuristic feel to it, where clients could not only see the hats being made but be a part of the process," she said. "Starting with a shape and then choosing their own colors, fabrics, ribbons and trims. The luxury of getting exactly what you want, made to order at an accessible price point and shaking the hand of the milliner who made it." JCM accommodates a variety of client needs, from hats for social events, horse races, religious services and nights on the town, to custom bridal pieces and a line of bow ties and pocket squares for men. Many styles are produced in limited exclusive quantities; custom creations are also available. Courtemanche also teaches hat-making courses, for both beginner and more advanced students, which are attended by millinery enthusiasts from around the world. She currently has a series of classes scheduled on Sept. 23, Oct. 17, Nov. 13 and Dec. 8 at The Bravo School of Art in San Diego. In addition to Jill Courtemanche originals, JCM will also carry lines of hats from The House of MacGregor (Dallas, TX), Cigmond (Brooklyn, NY), Eggcup Designs (Dover, Delaware), Heather Huey (New York, NY) and Romer Millinery (Summit, NJ) as well as scarves and accessories from Untold Imprint. 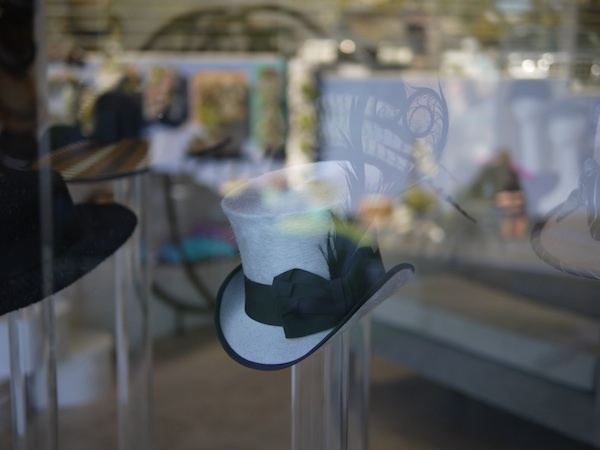 Jill Courtemanche Millinery is located at 410 South Cedros Avenue in Solana Beach.